Luxury Homes - Nativa Realty Luxury Homes by definition are registered in a class above all others. Such homes are earmarked for their superior quality in design, construction and often times where they are located. 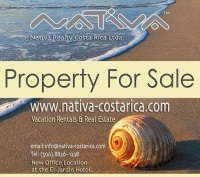 Herein you will find the finest homes for sale built along the rolling cliffs above Montezuma in the Southern Nicoya and along the shoreline of Mal Pais and Santa Teresa as well as in the hills of Manuel Antonio in the Central Pacific.Viewings are by appointment only.